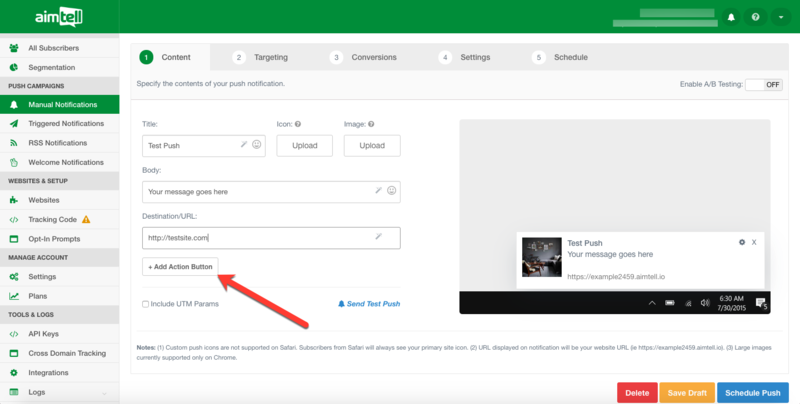 Action buttons are a way to add additional options to your manual campaigns. Action buttons are a great way to customize your push notifications. Adding an action button creates a way for multiple actions to be taken on a single push. Action buttons are a great way to let your subscribers know that you are offering a new product, or that you have published a new article or blog post. You can also use action buttons to help schedule an event such as a demo, or webinar. Every action button gives you the opportunity to add an additional landing page to your push. Currently, action buttons on push are only available on Chrome (desktop and Android). Once you have created a manual campaign, by clicking "Manual Notifications" on the Aimtell dash you have the option to add a button. (If you would like to read more about creating a manual campaign you can do so here). Just select "+Add Action Button". All you need to do in order to create a button is add your button text and the url of the page where you would like the button to land. All you need to do is schedule the push and you're good to go! It's really that simple! If you have any questions regarding adding action buttons to your manual campaigns, please submit a support ticket here.